Anyway, flash forward to my low carb life and I now love coconut and never more so that when combined with chocolate. 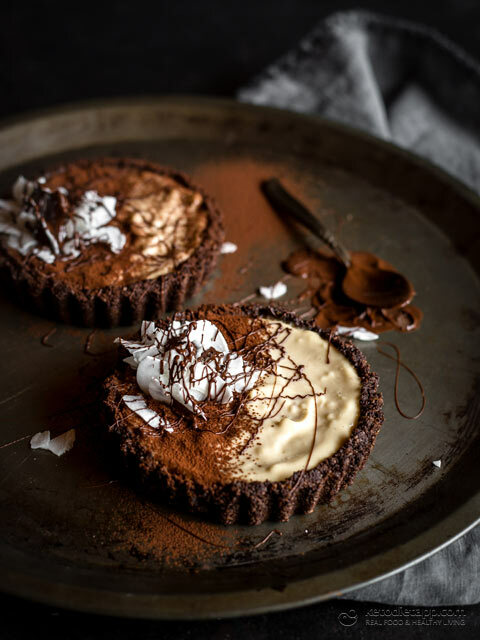 Now, these tarts are on the high end of low carb desserts, but… these tarts are divine. They are lush and decadent. 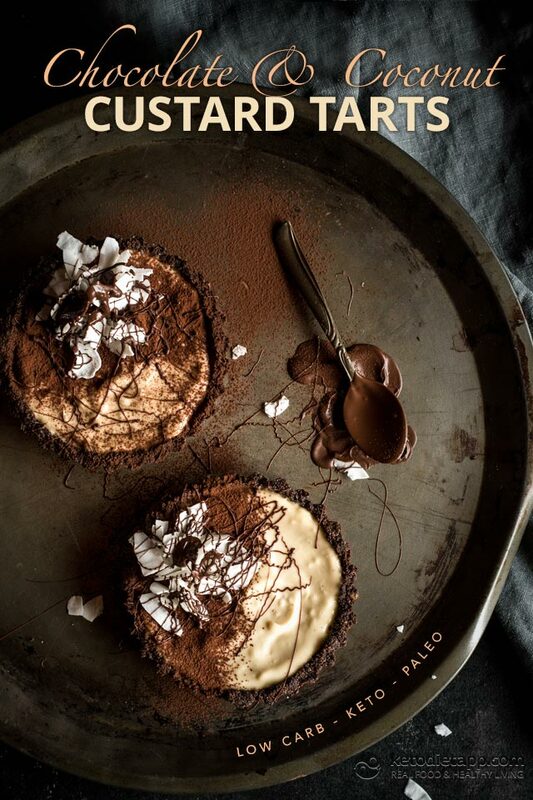 The velvety custard against the crisp crunch of the chocolate shell is a study in delicious textures. I digress, try them yourself and let me know what you think. Preheat oven to 180 °C/ 355 °F. 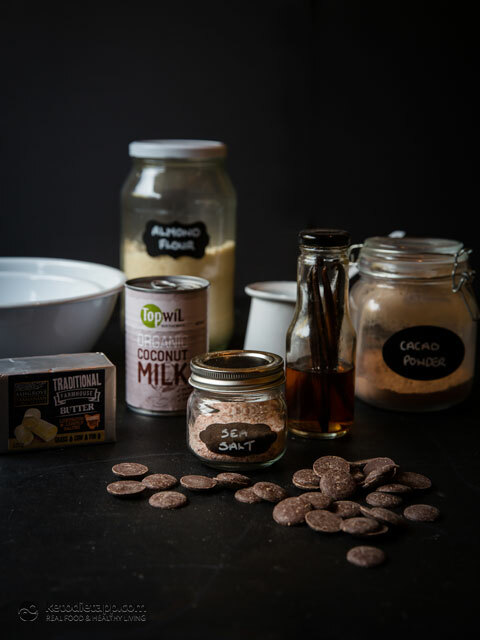 Place almond flour, cacao, Erythritol and melted butter together in a bowl and mix well. Spray one large of four individual tart pans with olive oil or coconut oil spray. 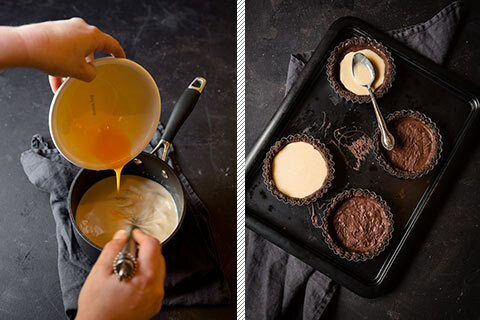 Divide the crust mixture between 6 tart pans (12 cm /5 inch each) and press into pan using the back of a dessert spoon. I have learned over the years to finish off around the edges using a 1/4 cup measure. The edge of the measuring cup helps to create a nice angle to the bottom of the tart. Prick all over the base of the tarts with a fork and bake for 12-15 minutes until cooked but no scorched. Remove from oven and cool completely. Melt the dark chocolate in a jug in the microwave or a double-boiler. 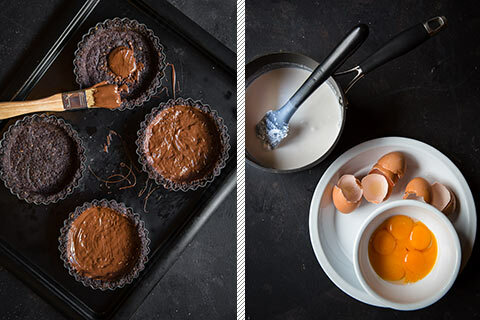 Paint a thin layer of chocolate inside the tart shell and place in the fridge to set (not only is this a delicious addition, but it helps to stop any sogginess of the tart shell). 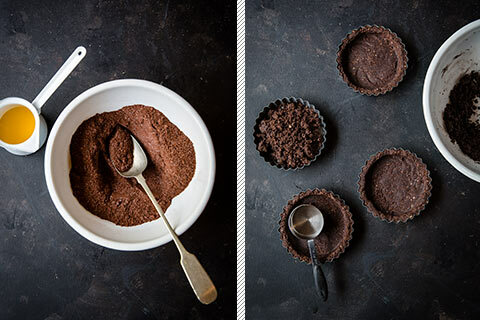 Sit the remaining melted chocolate aside to use to garnish the finished tarts. Meanwhile, place the coconut milk in a medium saucepan and add the sweetener, salt and vanilla. Heat gently until just below a simmer and remove from heat. Beat the egg yolks and egg in a bowl and very slowly add them to the hot coconut milk, whisking well the whole time. Return to the stove over a medium heat and cook for about 10-15 minutes, until thickened, stirring constantly. Once the custard has thickened, strain it through a fine sieve and then set aside to cool with a sheet of cling wrap on the surface to avoid a skin forming. Once cool, but not set, spoon into the tart shells and refrigerate until set. 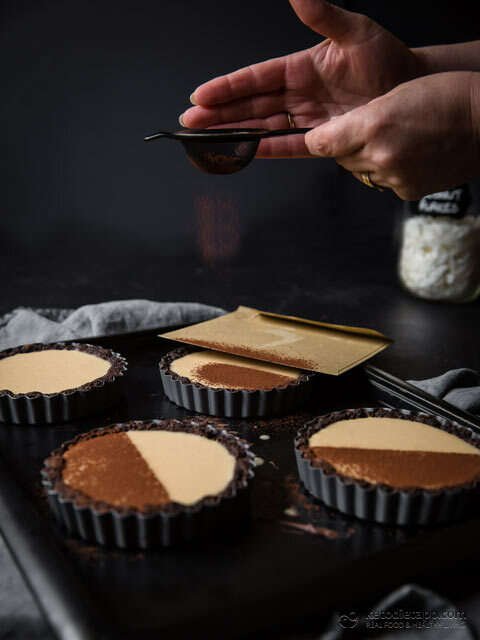 To decorate, place a piece of paper over half of the tart and dust the balance with cacao powder. Add some coconut shavings and then re-melt the dark chocolate. 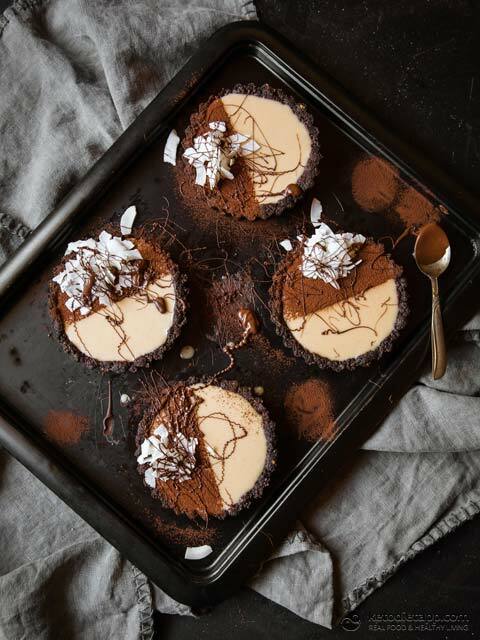 Using a spoon, drizzle the chocolate over the tarts. 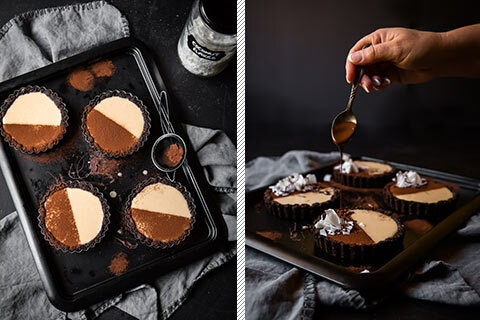 These tarts can be stored in the fridge for up to 5 days. Enjoy! Oh, that must have been so frustrating! The most common cause of custard curdling, both dairy or coconut, is that the proteins (in this case, the eggs) have overheated. 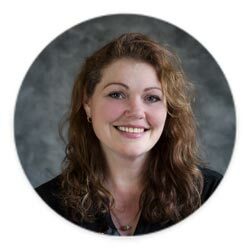 Maybe your stovetop cooks hotter than mine and you need to try a lower heat? And always whisk your eggs when adding to mixture to avoid them cooking in the hot liquid.